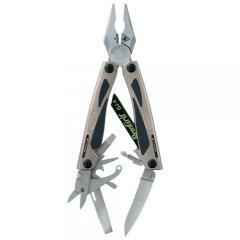 The Multi-Plier 800 Legend is an entirely different kind of Multi-Plier. Designed for the user who needs extreme wire cutting ability, quick access to the components, spring loaded pliers, and a secure ergonomic grip, the new Multi-Plier 800 Legend dominates the multi-tool category. Continuing the tradition of innovation, the new Gerber Legend is the first multi-function tool with replaceable tungsten/cobalt carbide wire cutter inserts. Much harder than any stainless steel, the Legend wire cutter will cut through #2 hard carbon steel fishhooks, 1/16" piano wire, and 278lb stainless steel offshore fishing leader. In the event of damage, the triangular cutter can be rotated to a new edge with a Torx® head wrench. When quick access to the components is a necessity, the Legend has no equal. All components can be used without opening the tool, solidly locking into place once rotated out for use. The Multi-Plier 800 Legend has a knife blade, scissors, crosspoint screwdriver, small, medium, and large screwdriver, bottle opener, and patented saw coupler with RemGrit® blade. The spring-loaded Fiskars scissors are the best scissors found on any multi-tool, being able to cut all braided fishing lines, hemmed denim, Cordura®, and leather. Needlenose pliers with indexible, replaceable carbide cutters, fine edge knife, Fiskars® scissors, cross point screwdriver, small, medium and large flat blade screwdrivers, bottle opener and file. I really do like it except they changed the working action from old style which was better. And no leather case.